As countries refine their national commitments (called INDCs) presented at the climate negotiations under way in Paris, it is important to think beyond power plants and automobiles. Forestry, agriculture and other land use represent more than 20 percent of global emissions, and are the dominant source of greenhouse gases in many developing nations. And encouragingly, many countries are starting to pay attention to these emissions sources. WRI analysis shows that the INDCs submitted so far represent the greatest collective commitment to reduce land use emissions ever seen in international climate negotiations. China, Brazil, Bolivia and the Democratic Republic of the Congo have put forth targets that could alone contribute to the protection of more than 50 million hectares of forest over the next 15 years, an area the size of Spain. This could achieve a reduction of 17 gigatonnes (Gt) of CO2 over 15 years, or 2.5 percent of the current total annual emissions globally. Still, commitments to reduce emissions from land use fall short of what must ultimately be done, leaving room for even more progress during the ongoing climate negotiations. Many of the top emitting countries are also some of the most heavily forested, and emissions from land use are especially outsized in Africa and Latin America where, according to WRI’s CAIT Climate Data Explorer, they contribute about 30 percent of all emissions. A tropical wet forest in these regions can store around 250 tonnes of carbon per hectare. 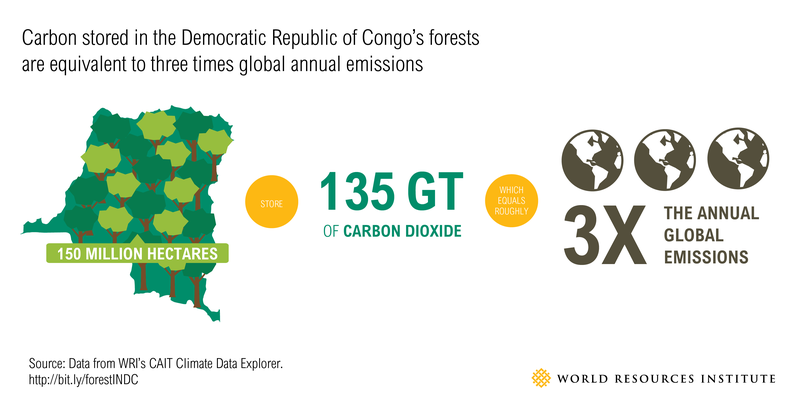 Thus, a heavily forested country like the Democratic Republic of Congo with its 150 million hectares of forests holds around 37 Gt of carbon. And if this forest was lost, it would generate 135 Gt CO2eq, or 3 times the total global annual emissions in 2012. China, Brazil, Bolivia and DRC all included INDC commitments to curb deforestation, which together will reduce global emissions by 2.5 percent. China accounts for nearly 70 percent of this pledge with its robust restoration and forest management efforts. Other countries, like Indonesia, Colombia and Peru, while not listing specific land use targets, mention the importance of land use in their overall carbon budget, which holds promise of forests and land use being included in their country-level implementation plans. Thirteen of the 34 African countries have strong, measurable land use commitments that include restoration, REDD+ and “climate-smart” agriculture (focused on increasing yields, economic gain and reducing GHG emissions). These would cumulatively lead to an estimated reduction of 1.2 Gt CO2eq over the next 10 years, or 36 percent of Africa’s annual emissions and 0.25 percent of global emissions. An additional 16 countries have less prescriptive goals that could still lead to further reductions. For many of these African countries, land use targets have the bonus of also providing economic benefits. Twenty-six of the 34 countries expect benefits like higher crop yields, reduced erosion, better use of degraded land, and greater availability of fire wood, fertilizer and shade trees. Of the 14 Latin American countries examined, six had quantitative targets that together could achieve a reduction of up to 6 Gt CO2 eq over next 15 years, or a 10 percent reduction of Latin America’s annual emissions and 1 percent of global emissions. Another five had qualitative targets. Unfortunately, despite the good example set by countries in Africa and Latin America, many other countries do not have specific land use targets in their INDCs. Although countries are not required to provide sector-specific information in their climate pledges, additional transparency could create the trust and clarity needed to help secure the global climate deal. Three important countries in this category are Russia, Canada and the United States. They are among the four most forested countries in the world (along with Brazil). If managed well, their forests could significantly help reduce global emissions by absorbing excess carbon. But counting on forests as a perennial carbon sink could reduce ambitions in other sectors. Russia’s INDC, for example, may actually increase emissions partly by assuming that Russia forests will absorb carbon at maximum capacity. But in a changing climate, nothing is so certain as forest fires and tree pest infestations have spiked in all three countries recently, releasing massive amounts of carbon. A recent study suggests that U.S. forests could cease to be a carbon sink in the next 25 years. Other countries could strengthen their current targets and strategies to address emissions from land use. While Indonesia includes ambitious land use targets in its INDC, its lacks sufficient details on the modelling of its carbon stock target, goals for restoration, and a plan to deal with out-of-control forest and land fires. For all countries, rich and poor, the land use sector is critical to achieving climate targets. The added economic benefits for low- and medium-income countries further strengthen the case. Many countries examined in this analysis are on their way with strong, measurable land use pledges. As the Paris negotiations carry on, countries that haven’t done so yet should follow the leaders and include measurable land use-specific targets in their contributions to the global deal.